Thanksgiving in the United States is also synonymous to Black Friday and Cyber Monday. This coming weekend showcases drop down prices on all stores (maybe not all) but big name stores usually do so during this time of the year. 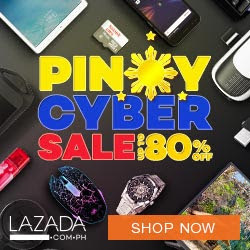 If you are in the Philippines, fret not as online reseller Lazada is offering the same deals here in our country!!!! Wow what a great way to shop in the comforts of our homes and with discounts of up to 80% on some items. So what are you waiting for? click on the images herein to bring you to the Pinoy Cyber Sale!!! !